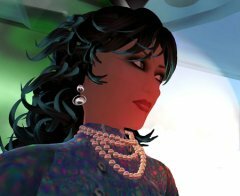 To spark conversation, I wrote an article called Marketing The Adult Second Life. Pasted below, plus on my 'Zindra Blog'; so its more searchable. The term 'adult' may refer to a stage of life, be it Second or otherwise, and there is a strong trend in marketing to create individual brands that speak to such specific stages. Virtual worlds can embody the whole 'casual' experience for various age groups, and provide a 'cradle to grave' opportunity if individual branding is adopted and promoted. An SL for each stage of life. To this end, a strong 'adult' brand may make sense to attract new residents, and to retain residents from previous stages of virtual life. Ready to upgrade your SL? With appropriate messaging that speaks to those in the right market, an 'adult' brand can be sophisticated and lucrative. The often hot-button issue of sexual content can be safely contained within the realm of grownup behavior, and can be assumed to be permissible with other spheres of 'adult' interests, such as economic stability, political and religious discourse, a myriad of adult 'hobbies', and other academic pursuits. In short, the world of 'adult' can be many things. What interests adults and how do we speak that language in branding? I favour this one theory: While children have the wondrous sense they can do anything, adults have learned practical sense of how they might achieve it. Children may enjoy the playground, but adults will have learned how to provide a better one for their children. Adults can make a difference in the world in which they grew up. Making a real difference in the world, gaining satisfaction from work, and having an impact on the future......these may be the dynamics that 'speak' to adults. Identifying such sensibilities and working them into the marketing for an adult brand may provide a rich and attractive means to grow Second Life. Keeping the various age brands very distinct is important, but a understanding of the evolution between them should be apparent. When its time to 'move to adult' , the transition should be safe and secure, yet intuitive and presented as opportunity, not obstacle. A strong and alluring adult brand will present new marketing avenues and perhaps lead to a great increase in residency within Second Life. Rather than relying on accidental discovery of the grownup world within what many may sense as a children's game, purposeful branding and marketing to adults can overstep this problem and allow fantastic growth of a truly dynamic population. There is a new way to market your product to the Adult community through Second Life Advertising. Though currently in Beta it offers a way to create web banner ads targeting Second Life users browsing the Marketplace based on the maturity level they've selected. In other words all purchased adult advertising banners reach people that have actually expressed a desire to see adult content! Good news abt the adult classifid ads, Blondin! I assume you have broadcast this all over the place? It's worth telling everyone about! (if there is some bloggable copy abt this development available I'll help blog it around too). Also, to help enable search results, be sure to have accurate parcel descriptions. Our filters will pick up keyword stuffing as spam. So be as specific as possible! It will only be valuable if the ads are mapped to the level/s chosen - so if a user selects all three ratings they see all three ad levels and if they choose adult they only see adult. However, if LL is true to form this will be a matter of paying the same as everyone else and being buried in the morass of non adult content, despite the user only wanting to see adult rated content. We went through this with XSL and the homepage ads, before LL took them over an adult homepage ad garnered around 70% of the number of views a non adult ad did - despite it costing the same amount. By the time LL had finished tinkering it was down to around 10% of the number of views a non adult ad gained and still cost the same. My suggestion is that I'd attempt to try to demonstrate some value for money before pushing this. Since Adult Content policy made paid adverts very ineffective for Vesta and me, we've been forced over the last year or so to come up with alternative marketing methods, which work pretty well for us, and I'll need a bit of persuading these targetted ads should make much of a difference to how we're now doing things. On a related note, I've noticed that the Marketplace, by default, now shows me items from all maturity levels when I visit it, and has done for the last few weeks. Is that because it's at last remembering my settings from the last search, or is it using my in-world settings, or what? Good feedback. Thank you. I'll pass it along and see what kind of response I get.